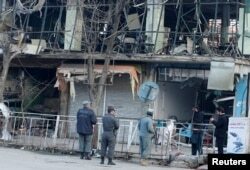 Afghan policemen inspect the site of a bomb attack in Kabul, Afghanistan, Jan.28, 2018. Eleven members of the Afghan National Army were killed and 16 others wounded in an early morning attack on a military academy in Kabul Monday. "The attack is against an army unit providing security for the academy and not the academy itself," said Dawlat Waziri, a spokesman for the Afghan defense ministry. Afghan authorities say there were 5 suicide bombers: 2 blew themselves up, 2 were killed by Afghan forces, and one was arrested. Afghanistan's National Directorate of Security (NDS) released this photo of the man they say is the surviving suspect. 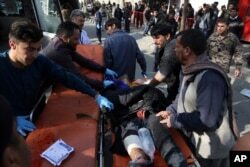 An injured man is moved to a stretcher outside a hospital following a suicide attack in Kabul, Afghanistan, Jan. 27, 2018.